It’s easy to buy beauty products that promise to revolutionize your hair, your teeth or your skin. But in reality, they’re not necessarily always going to work. Natural beauty remedies that aim to beautify your body from the inside out may be more effective than you realize. Consider these four strategies for improving your overall looks and health from the inside out. Beauty is far more than skin deep. How you treat your body on the inside affects how you look on the outside, but most women I see only focus on surface matters—they usually use a commercial cleanser and moisturizer on their face at night and in the morning; they wash their hair with a shampoo and conditioner three to four times a week; and probably use hair products that promise to control frizz or add volume. Second, and perhaps most importantly, you are ignoring the inside. What you put into your body can make a huge difference on the outside of your body, in how you look and feel! Here are four natural beauty remedies you can use that work from the inside out to make you, your skin, and your hair look their best. These strategies are vital ingredients to looking young, fresh and radiant at every age. Altogether, I believe these four components are essential to every beauty routine. Here are several supplements that do wonders for your skin and hair. All of these natural beauty remedies will work together to increase radiant skin and reduce breakouts and dryness, making them simple, natural beauty remedies you can add to your daily routine. Collagen is a protein powder that promotes weight loss, gut health and improves skin. Research shows that collagen is effective in helping to maintain lean body mass, reduce wrinkles and cellulite, suppress your appetite, and strengthen your hair, nails, and bones. You can buy it in a tasteless powder supplement, and I personally love using Further Food Collagen Peptides! It’s simple to add a couple of tablespoons of tasteless collagen powder to your morning coffee or tea (or overnight oats). And collagen is also great for acne! Recently, one of my patients who struggles with cystic acne said collagen has reduced her breakouts by more than half! 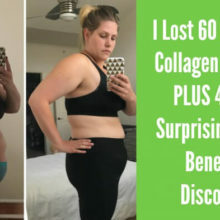 She’s been adding collagen to her morning smoothie for about a month. Such amazing changes can come from this natural beauty remedy in such a short time. So exciting. Biotin is one of the B complex vitamins that help your body convert food into energy. This supplement helps maintain the health of your skin, nails and hair. I recommend a once a day supplement of 2,500 micrograms. Taking regular probiotics and digestive enzymes can also help regulate and balance your entire system. Eating for beauty is essential, and the first step is to minimize anti-inflammatory foods that can cause breakouts, as well as dulling and thinning your hair. The most common culprits are refined carbohydrates, yeast, lactose, milk products, alcohol, saturated and trans fats, artificial sweeteners, processed sugars, red meat and overly processed foods. To improve your inner and outer health, add in lots of natural beauty remedies: drink lots of water, maximize your vegetable and fruit intake, and stick to whole grains and lean poultry and fish, tofu and legumes. Use healthy fats such as coconut, avocado or safflower oil for cooking. Another easy way to balance your pH and help your skin and hair is to start every day with a morning tonic. I like a shot of Apple Cider Vinegar water (1 to 2 tablespoons of raw apple cider vinegar diluted in a few tablespoons of slightly warm water). It’s called beauty rest for a reason, and it’s one of the only totally free natural beauty remedies I can think of! If you have trouble sleeping and spend the day feeling groggy and trying to get a boost from multiple cups of coffee, I’d bet that it reflects on your face. Your skin makes collagen naturally when you sleep, so if you shortchange yourself on your slumber time, your body doesn’t have the time it needs to complete your skin’s repair process. Your body also boosts circulation to your skin during your nighttime rest—you can erase age lines and minimize those puffy, darkly-circled eyes by getting seven to nine hours of sleep every night. Picking the same time to fall asleep and get up each day will help your body’s rhythm (most women need at least 11 p.m.-6 a.m.). The good news is that there are simple, pure ingredients you can use to make your own DIY beauty routine complete, and most of these natural beauty remedies can be found in your kitchen! The ingredients that are in my beauty pantry always include collagen, coconut oil, olive oil, apple cider vinegar, plain or homemade yogurt and castile soap. With these ingredients, you can make countless natural beauty remedies for smooth, glowing skin and shiny, rich hair. For specific recipes, check out my new book, the Super Woman Rx here. 5 Surprising Reasons Why Sugar is Making You Age Faster! How Good Is Your Health Mojo? Take a Quiz by Expert Dr. Taz Bhatia To See How You Score!